The world of the internet is filled with a clutter of websites that are developed with the help of different programming languages, offering different benefits and drawbacks. 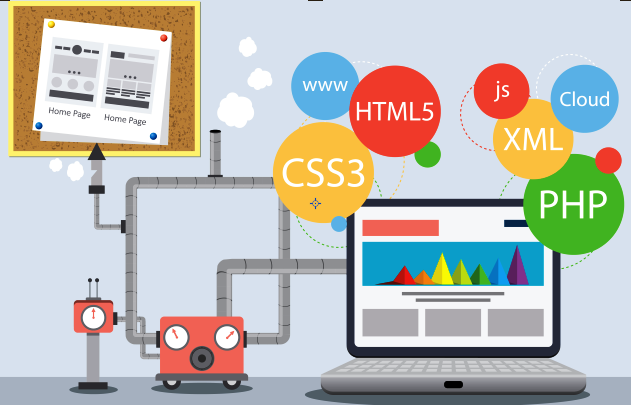 With the availability of a plethora of programming languages for the purpose of development of a website, you must choose the one that suits the best to your needs of a website. Before making a choice of the best language, you need to have a basic understanding of all the available web development programming languages used to develop different websites available on the web. This language can be referred to as the king of the web development world in the category of server side languages. Websites developed with PHP Development India have covered around 75% of all the servers hosting different websites. Many well-known websites are known to have been programmed with this language, like the Wikipedia, WordPress and a part of the Facebook that users are able to see. Being a server-side language, the code written is processed before the display of the final page to the user, where this language is combined with MySQL for database related functions. This is not a programming language, rather an open source and free database server, but it offers a new language that users need to learn, in order to deal with databases. MySQL is a command-line language with some common GUI tools like PHPMyAdmin available for an easy database management. This language has been known to be the best web-programming language in the past, which can process text very fast. With being a common target of hackers, this language isn’t of much use while programming web pages nowadays. This is a strong-typed full object-oriented language, which is easy and fun to work with, but attracts a few real-world applications only. Python is used mostly by programmers, working for the development of community-driven, open source and Linux projects. Ruby is another web-programming language that is used along with its framework Roby-on-Rails in many websites like Shopify, Groupon and Twitter’s front-end. This language works similar to PHP with some advantages like less repetition of code, speed, and rapid development, but is not supported by most web servers. Contributed by Microsoft, this language is used in corporate environments only due to its high security, which requires a particular Windows hosting for execution. I am in fact delighted to glance at this webpage posts which contains tons of valuable information, thanks for providing these data. Please contact us for more information on this excellent post. remark on few general things, The web site style is perfect, the articles is really excellent : D.
You guys are the best..
where is java EE ?? Fantastic list. Didn’t see java though. Thanks so much for this post. There are so many different programming languages to choose from. I’m so glad that you provided some information about the best ones for web development.